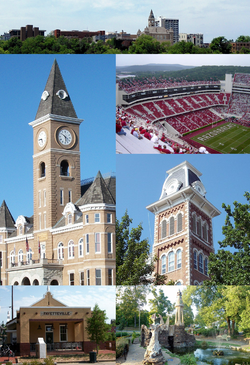 Clockwise frae tap: Fayetteville skyline aroond the Heestoric Squerr, Donald W. Reynolds Razorback Stadium, Old Main, Wilson Pairk, the Fayetteville Depot, an the Washington Coonty Coorthoose. Nickname(s): "Track Caipital o the World", "Tylerville", "Fay", "Fayettenam", or "Faytown"
Fayetteville is the third-lairgest ceety in Arkansas an coonty seat o Washington Coonty. ↑ "#28 Fayetteville, AR". Best Places For Business And Careers. Forbes. 2013. Retrieved July 23, 2011. ↑ Bartholomew, Dustin (November 9, 2009). "Does Fayetteville really need a nickname?". Fayetteville Flyer. Retrieved July 18, 2013. ↑ "American FactFinder". United States Census Bureau. Retrieved 2014-12-02. ↑ "Population Estimates". United States Census Bureau. Retrieved 2014-12-02. This page wis last eeditit on 11 Mairch 2018, at 16:33.